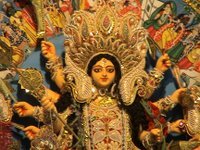 Today is the 8th day of Durga Puja. We Bengalis call it simply as “pujo” which means “worship.” It is the biggest festival for Bengalis across the world. In the SF Bay area, several temples have puja. I will attend a few tomorrow and have some bhog. For now, here’s something I recently learned about from a friend on the East coast: Vigyan Bhairav Tantra. Bhairavi is a fierce and terrifying aspect of the Goddess virtually indistinguishable from Kali, except for her particular identification as the consort of the Bhairava.
. . . Bhairavi is seen mainly as the Mahakali in the Durga Saptashathi version of slaying Shumbha and Nishumbha. Vigyan bhairav tantra is an ancient treatise containing 112 techniques of meditation. If translated in English this is what it means: Vigyan = science; Bhairav = another name of the Hindu god Shiva; Tantra = technique. Instead of giving her a direct reply, Shiva tells her about meditation techniques which will lead her to the experiences – experiences that will be the reply to her questions. The most detailed commentary on recent times on Vigyan bhairav tantra has been by Osho (Bhagwan Shree Rajneesh) which was published as the Book of Secrets. Here is a nice offering to Devi Durga, or Shakti, Narayani, Gauri, Mahakali, etc. pls see whats happening in deganga, kolkata. I Sincerely pray to Durga Mata, to instill sense and wisdom on the present ruling class / press and Powers that may be in Govt. to ensure that they stp this sickular policies. Thanks for giving good info about the”Durga Puja Notes”.“pujo” which means “worship.” It is the biggest festival for Bengalis across the world.the video is also amazing..